I swear time in Newcrest passes by slower than when I was living on that plum island – it feels like I’ve been here for a lifetime already! Though I guess it’s like we’re living a whole different life here. The isolation is gone. Everyone knows us. And I know no-one. I’m surrounded with pictures of people I’ve never heard of. Supposedly they’re family. But that’s bullplum. They’re just empty photos, someone else’s memories. You’re my only family, even though we’re not related. When it comes to my actual blood family… yeah things are still pretty iffy. Mom and I barely speak. I want to hate her for ruining my life, but it’s hard when she’s so broken. She’s been crying a lot. Especially in that room full of old photos of those random people. Eventually, even she could see that living in her childhood home was not working out, so she converted the house into an art gallery. Personally, I find the gallery a bit of a snoozefest. I grew up around these plum paintings, they were the only thing keeping me company as a kid. But hey, at least now they’re here in the gallery and not in my house. Not that we live far… we moved right next door, to this apartment above a bar. I know it sounds cool, but really, the bar is dead most of the time, since no one really runs it. Most of Newcrest is dead, to be honest. It’s just so lame compared to Windenburg! I came across this abandoned guitar in just behind the art gallery the other day, but there was nobody playing it. Davion would be right on that if he was here! So, him and Starr, huh? That’s cool. I’m happy for them. Totally. Ok, not really. But I don’t blame him. He can’t wait forever. Anyway, where was I? Oh yeah, the town being dead. There are people here, of course. Like my supposed family. They’re pretty nice, actually – it’s hard to believe they’re related to my mom. They don’t look or act anything like her. Uncle Noel is the oldest brother. He’s pretty ambitious, chief of staff at the local hospital. He’s married to a smart lady called Kiersten who is a doctor too, and they have a daughter called Tania who is a few years older than me. And then there’s uncle Theo. He’s a gloomy comedian. I know. He has this morbid kind of humour. His wife Anika manages the local bakery, Monty’s Goodies. And they have a son called Grady who’s Tania’s age. I don’t know. They’re all really kind and polite, but they still feel like strangers. I do always accept their invitations to come over but… there’s just no real bond there. Even your parents feel like more of a family to me than these people do. Doesn’t help that mom never spends any time with them. They used to ask us both to come by, but I think they’ve given up on her now. So she just spends time on her own and paints depressing pictures. I don’t know how to help her. I tried talking to her, but it all escalated all too quickly. Before I knew it, we had a massive argument. Again. Ended up with me saying I can’t wait to get out of this plumhole. Oops. I tried. I really did. But at the end of the day, it’s true. I can’t wait to go back to Windenburg. And to see you again, and the others. Even that traitor Davion. I miss you sis! Counting down the days till my birthday! “You would think if this legacy is so important to her, she would have mentioned it before,” Peyton pointed out. Everybody sat in silence. Davion stood up and started playing his guitar. Normally, hearing him play always made Pauline happy, but this time, tears started rolling down her cheeks. Pauline hadn’t thought of it that way. Moving to Newcrest sounded like a sentence. But maybe it didn’t have to be… though what would her mom say? She sat down, her head spinning. “How are you holding up?” Davon sat beside her. He jumped up and took Pauline’s hand, leading her towards the ruins. The further they went from their group, the closer he seemed to be getting to her, his arm wrapped around her body. And then they stopped walking. Pauline held her breath. “I thought I should do that before you go,” he announced. “I’m glad you did,” Pauline grinned. And then they kissed again. And again. Pauline pretended time had stopped. That she was never going anywhere. All that mattered was this moment. But when his hands got a bit too enthusiastic, she pushed him away. Pauline was feeling a million things at once. “Thanks, Davion,” she replied simply. The two of them walked back in silence. The moment Pauline saw her best friend’s expression back at the fire pit, she forgot all about Davion. The two girls hugged each other tightly. The sun was already up as Pauline finally made her way back to the island. She was greeted with the furious Astrid. “Where have you been all night? And don’t say you went for another one of your walks! You’re not keeping the truth away from me this time,” Astrid shouted. “Pfft.” Pauline didn’t feel like acknowledging her mother’s question. Keeping the truth away? That was rich, coming from her! Astrid was in her head. Flashing light. Pauline regained her vision again. Her mother was looking at her as if she’d seen a ghost. Pauline was taken aback. A part of her felt guilty, but then, it wasn’t her fault she didn’t know anything about these people… did thinking that make her a bad person? It wasn’t like it made a difference. They were headed for Newcrest that very day. Pauline quickly became a part of the group, making several secret trips to the mainland. She fell in love with Windenburg and the people in it. Why her mother chose to stay secluded on that small island was beyond her. But she didn’t care. For the first time ever, she felt alive. Usually the gang would just pick a random location to gather, play music together and dance, but sometimes they branched out a bit; went to the movies or the arcade and just goof around. To no-one’s surprise, she excelled at video games too. There seemed to be nothing Peyton couldn’t do. Pauline couldn’t believe her luck. Not only did Peyton change her life for the better, but she genuinely seemed to like her. Her, the weirdo from the island. Pauline was slowly working on trying to accept being an alien, being different. And Peyton was eager to help. “Um, blue?” Pauline suggested hesitantly. And so, with Peyton’s help, Pauline got a makeover. She ran her fingers through the vibrant blue locks. “You look so good, it’s really brightened your face,” Peyton encouraged her. Pauline examined her face as she took a selfie. Maybe, just maybe, the reflection on her screen was not the ugly creature she had been seeing in the mirror for years. “Like what?” Peyton arched an eyebrow, confused. Peyton tilted her head, as if she was thinking. “And you’re mine,” Peyton replied simply. “We’re sisters, remember?” she winked. Playing the guitar wasn’t so hard, Pauline thought to herself as she was trying to replicate the chords Davion had taught her. He’ll be so proud! “Pauline, I need to talk to you,” Astrid came in. She paused for a moment, taken aback by her daughter’s appearance. “Do you like my new hair?” Pauline smiled. “I know it’s different, but isn’t it a lot more creative?” Pauline knew that appealing to her mother’s artistic side was the best way to appease their differences. “Um, sure,” Astrid nodded absent-mindedly. “YOU HAVE A BROTHER?” Pauline interrupted. “And you never mentioned this?” Pauline couldn’t believe it. What else did she not know? “Remember when you asked me how and where I was born?” Astrid asked. “And you never thought you should mention any of them?” Pauline grew more and more irritated. “And why is the time suddenly right now?” Pauline growled. “Where have you been?” Astrid glared at Pauline as soon as she walked through the door. “I just went for a walk,” Pauline replied. Luckily it was too dark for Astrid to see her daughter blush. Pauline had never lied to her mother before. But hey, she lied to Pauline about the mainland, so it was only fair… right? She’s your mom, Pauline reminded herself. There must be a reason for this. A big misunderstanding. Pauline frowned. Still the same old story. Astrid sat still for a moment, dumbfounded. This wasn’t working, Pauline thought. Astrid never answered any questions about Pauline’s father, and today was no different. She thought of Peyton. Astrid was concerned. She knew these questions would be inevitable one day, but she still wasn’t ready. Pauline sighed. There was no use. Her mother was trying to teach her a cautionary tale, without telling her the actual story. What could have possibly happened that was so terrible? But fine. If she didn’t want to share the whole truth, neither would Pauline. She had one last idea. So there it was, Pauline’s mother had indirectly given Peyton her blessing, without knowing. If lying, or rather, not telling the full truth, was the way to keep her new friend, then so be it. After all, it was the only example she’d been set. The next time Astrid had to leave the island for business, Pauline invited Peyton and her crew over to the island right away. “Wow, you live in paradise,” Starr shrieked. “One man’s paradise is another man’s prison,” Pauline smirked. “Wouldn’t mind this being my prison,” Ted, the green-haired boy laughed. The other boy, Davion, who had first discovered Pauline in her hiding spot just smiled and started playing his guitar. Soon enough, everybody was dancing to davion’s tune. One thing Peyton’s friends had in common was their love of music. And boy, was their dancing something else. Astrid was in awe when Ted added fire to his performance. “Woo, you can do it this time, Ted!” Starr clapped enthusiastically. “Or not,” the blonde giggled as her friend almost caught on fire. Luckily, being on an island, water was not too far. And then Peyton showed them how it’s done. Pauline’s heart was beating rapidly. She had friends. And each of them was amazing. Peyton, of course, stole the show with everything she did, but she admired every single one of them. And they all adored music just as much as she did. No matter what her mother said, Astrid was one of them. And she needed to show them. Her hands trembling slightly, she pulled out her violin. Soon enough, her fingers loosened up as her heart ran away with the sound. And then, when she started paying attention again, she noticed that Davion was playing the same melody. Their instruments danced together, their spirits were talking without either one saying a word. Pauline wasn’t sure how much time had passed. “Man, we need to do that again,” Davion grinned. “You’ve got some skills! And I’m not just saying that because you’re pretty,” he winked. Pauline beamed. She wasn’t sure what she thought of Davion yet, or if she liked him that way, but she knew one thing; playing her violin with him gave her butterflies. “What’s up gang?” The alien girl approached them, smiling broadly. Pauline’s head was spinning. This wasn’t possible. Was she dreaming? Did her fantasies get so realistic looking that she couldn’t tell them from reality anymore? “We’ve got a newcomer, Peyt,” the blonde girl announced excitedly. “My name is Pauline,” Pauline said weakly. She still didn’t understand what was happening. The girl in front of her was clearly an alien, a full one, just like her mother. But none of the others seemed to care, or mind, if anything, it seemed they all admired the Peyton. And Peyton didn’t appear to be ashamed of her appearance one bit, on the contrary, she looked so happy… Pauline couldn’t take her eyes off hr. It was all so puzzling. Before she could say anything else, the girl hugged her. “Welcome to the family,” she grinned. Pauline froze. This had to be a dream. “Well yeah, the port in the distance… wait, have you just landed on the planet? I always assumed all aliens would only ever get here the same way I did, but I guess that’s pretty close-minded of me,” Peyton pondered. “No, I was born here, actually,” Pauline explained. “Just on these islands. But I’ve never been to the mainland… How did you get on this planet?” Pauline asked. “My parents think they’ve been experimented on by aliens,” Peyton shrugged, as if it was no big deal. “What do you mean?” Peyton asked. “I never thought of them as powers,” Peyton said. “But yeah, I guess I do. I can read people’s minds if I want to, and pretend to look like someone else. But… why would you want to? “So you don’t hide from people on the mainland? And they don’t think you’re a… monster?” Pauline’s voice was barely audible. “Are you sure this is safe?” Pauline looked around nervously. The mainland was prettier than she’d ever imagined, and so far, they hadn’t run into a soul. But Pauline was terrified of meeting the locals. With a silent plea, Pauline followed Peyton into the house. “Hey guys, I brought a friend for dinner, is that cool?” Peyton greeted her parents. “Any friend of Peyton’s is a friend of ours,” Peyton’s father smiled at Pauline. “Da-ad, don’t be corny,” Peyton rolled her eyes. “Have you just moved to Windenburg, Pauline?” Candy asked the newcomer enthusiastically. “I grew up on one of the islands, but normally only my mom goes to the mainland. She’s a painter,” Pauline changed the subject. “Don’t say that, your music is art honey,” Paolo praised his wife. Pauline remained mostly quiet during dinner, just taking her surroundings in. The atmosphere around the table was so genuinely warm; Peyton’s parents seemed enamoured with each other and Peyton was acting so natural and carefree around them, as if she had no idea how lucky she was. Everything Pauline had ever known, everything Astrid had taught her… was the world really that different from what she’d been told? And why would her mother lie to her? Everyone gathered in the living room after dinner. Peyton wasted no time and started dancing to Candy’s music. Pauline tried to dance a little too, but she was too overwhelmed and needed to sit down. “Are you ok, Pauline?” Peyton joined her new friend and her father on the couch. “I… your family is so amazing,” Pauline breathed out. “They have their moments,” Peyton chuckled. “It’s just,” Pauline didn’t know how to choose her words, but she had to ask. 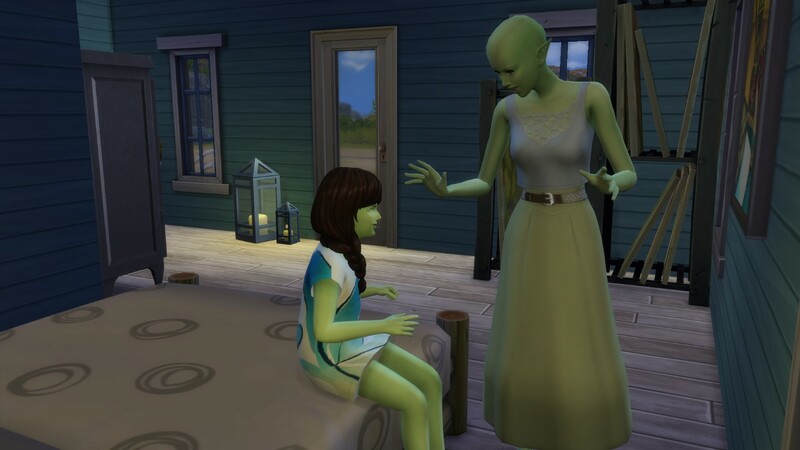 She looked at Peyton’s father: “I would have thought you would hate aliens… They experimented on you, took your memories, kidnapped you and…” She stopped herself, scared of losing her new friend if she said more. But Peyton just smiled. “And of course, they gave us our beautiful daughter! We would have never had any children if it wasn’t for that. So if anything, we should be thankful for those aliens. Bring on more of them,” he laughed. “So, are you not scared of the mainland anymore?” Peyton asked as the girls said goodbye later that evening. “You need to ask her,” Peyton encouraged her. After her mother’s revelation, Pauline continued living her lonely life on the island. She accepted her fate of being a monster, since there didn’t seem to be an alternative. And as Astrid’s painting career blossomed, making her travel off the island more and more often, Pauline found herself on her own more often than not. As a painter’s daughter, she kept busy with art. Astrid made sure Pauline always had plenty of painting supplies to follow in her mother’s suite. But as much as Astrid tried to push her daughter towards the easel and brushes, Pauline’s true passion lied in music. It soothed her soul, and transported her to a world of imagination, a world where even a strange form like her could have friends and be a part of something. But of course it was all just a dream. In the end, it was just her and her violin. And sometimes, Astrid. Whenever Astrid had to leave the island for work, her face was full of disdain. But it was the necessary evil for her to be able to return to her little slice of paradise and continue painting. Pauline didn’t get it. She would give anything to be able to be able to slip into a disguise and venture out to roam with other sims. She was jealous of her mother’s trips. But at the same time, they gave her the opportunity to get as close to being a part of the world as she could ever hope for. Pauline had never forgotten about the secret passage to the Bluffs. She would sneak away every time Astrid was out of the picture. Sure, she was more careful now. She lingered in the shadows, only coming out of hiding when there was no one around. But her favourite times in the Bluffs where those when other sims visited the place, and she would be able to listen to them, tucked away in the bushes, fantasising about being one of them. “Cannonbaaaaall,” a girl yelled out, followed by a splash. Pauline felt a few drops of water hit her ugly skin. It was a strange sensation. They were so close, yet so far. “Count on Starr to make an entrance,” one of the boys laughed. “She’ll be here any moment, you know time management is not her strongest suite,” the green-haired boy shrugged as he climbed out of the water. “Please don’t hurt me, I’ll leave immediately, I promise,” she stuttered. “Guys, this is SO cool,” the boy with the green hair interrupted. Pauline was confused; were they not going to hurt her? And who was this girl they kept talking about? “Did anyone say Peyton?” a distinct voice called out from the distance. Pauline was speechless. She’d overheard many conversations in the bluffs, but she only knew of one person with a voice like that: her mother. Growing up on an island had its ups and downs. Pauline loved the sea surrounding her, being able to run among the sandy beaches barefoot and the lush nature. Every tree was her treehouse, every rock was her observing platform, every bush was her fort. And best of all, she got to share the island with her mom. There was nothing her mom couldn’t do, and nothing she wouldn’t be able to teach her. Her mom was the most amazing person Pauline had ever met. Of course, she was also the only person Pauline had ever met. Pauline often wondered what was beyond their little piece of the world. She knew there had to be something, since her mom sometimes left with all of her paintings to go to a place called the mainland. All Pauline knew about it is that it was a dangerous place that her mother was protecting her from, so she would never go there. But still, living on a single island makes you feel restless. But what would the rule be for a secret passage going into the shrubbery at the far end of the island? Pauline hesitated. She looked back towards the cottage she grew up in, took a deep breath, and walked through the branches. What she discovered was like nothing she’d ever seen before. There must have been a castle here a long long time ago, but not much has been left. Instead, a gorgeous natural pool lay ahead of her. Eager she climbed up onto the platform and dove straight in. It was the most fun she’d ever had. She wasn’t sure how much time she’d spent splashing in the water, but her initial excitement was gradually replaced by inexplicable sadness. How come she hadn’t known about this place, even though it was so close to her home? And what else could be hidden from her right under her nose? “No! I don’t want to, I’m not going anywhere,” Pauline shouted. Pauline followed her mother begrudgingly. She’d never been this angry at her mother. There better be a good reason for all this. If not, she would run away from home, she decided. Pauline’s jaw dropped as she watched her mother twirl around and turn into a strange green creature with bug-like eyes. Something beautiful. Easier said than done. Pauline stared at the crayons in her ugly green hand. She’d never thought about it before, the way she looked. How could she not have seen it before? She was hideous. And because of that, she would never be able to be seen by anyone. In the years to come, Pauline would never forget this day. One mad dash, several boat rides and a long swim later, Astrid finally deemed it safe to stop running. There was no place more secluded than the uninhabited island she found herself on. She breathed in and out, relieved, finally able to get away from it all. Complete solitude. She decided not to contact Candy and Paolo ever again. In all honesty, she didn’t want to speak to a soul. After all, all she’d brought to both her loved ones and herself when trying to make friends on the mainland was pain and suffering. And then it hit her. Why not? She could easily remain here for good. Her ancestors, the founders of Newcrest, lived off the land, why couldn’t she? All she really needed was a place to sleep, some food and water, and of course, the ability to paint. All of which this island should provide. Maybe she’d need to travel to the mainland occasionally, to sell her paintings, but a new disguise should sort those infrequent needs. She smiled and quickly whipped up a new disguise. Here we go again, she thought to herself with a smirk. Except this time, she wouldn’t let anyone get close. She’d swap out her looks every so often, be the mysterious painter that only ever talks art and disappears before you can get to know her. She would probably swap her disguise to a new one every couple of years, just to be on the safe side. No one would ever quite know what she looked like, or who she was. They’d only know her name, and her art. This way, she could live safely and protect both herself and others. But first things first. She’d already passed by a stream, so a source of water was available on the island. Now she just needed to find food for the night. She celebrated the first day of her new life with a grilled trout, with nothing but the stars and her thoughts for company. She could get used to this. As for the sleeping setup, one of the abundant bushes would have to do for the night. Though of course, the setup wasn’t ideal. She’d better get started working on a home of sorts! It took some time, but eventually, she was able to build a small cottage with all necessities. The island had truly become her home. She passed the days painting to her heart’s content, just on her own. But of course, she wasn’t truly alone. As much as she’d like to tell herself it was an accident, it wasn’t really like her to just forget and not be careful. No, on some level, she must have wanted this. So that she would get to keep a part of Paolo forever. Maybe it was selfish, but it couldn’t be undone, as the baby was ready to come to the world. Since hospital wasn’t an option unless Astrid wanted her true identity exposed, she went through the pain of childbirth in her little shack. But it was all worth it when she held the newborn in her arms. Sure, babies weren’t always the easiest to be around, and painting would have to take second place for a while. But what did that matter now. She might seclude herself from all humans, but she’d never be alone again. “It’s just you and me against the world, Pauline,” she whispered. I’m looking for some fresh faces for my story! If you have any young adult sims you would like to donate, feel free to upload them on the gallery using the hashtag #BloomerLegacy. I’m accepting sims of all genders, shapes and sizes; and I would love some ethnically diverse sims! I’m fine with sims fresh out of CAS or established sims, whatever floats your boat. My only conditions are that they must be YA and CC-free. I am taking two sims per person to keep things fair. 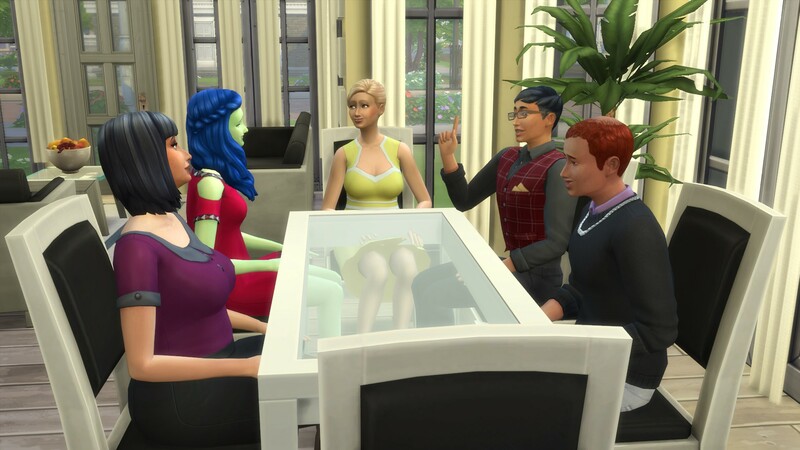 1) It will most likely be about 5-6 weeks till any of the sims appear in the story – sorry! The only way I’ve been able to deliver regular updates for you guys with my current schedule is by being ridiculously ahead of my story. 2) The submitted sims will basically become new townies in my world. Since I let my sims determine their own story for the most part, there is no guarantee of how prominent these characters will be in the legacy. It might be the case that we’ll only catch a glimpse of them briefly, or they might become the next Ethan; I don’t know! It’s all in my sims’ hands! If you would like submit your sims even after reading above, let me know! It was chaos in Astrid’s head. One thing was certain though, it did wonders for her paintings. And so she painted away. “Woah, is this not a good time?” Paolo asked, wiping the paint that splattered him from forehead. “Sorry… the creative process, you know,” Astrid said apologetically. “You getting cold feet?” Astrid heard her own voice grow significantly more high pitched than she had intended. …and there was no looking back. The painting Astrid made when she thought about Candy and Paolo together just stood by in silence. “Wow, that was really something,” Astrid giggled happily. She knew she shouldn’t feel that way. But she couldn’t help herself. “Paolo, there is undeniably something there, between us,” she held her breath. “But… but… you said you felt something,” Astrid couldn’t help but start sobbing. He quickly threw his clothes on and walked out the door, leaving Astrid speechless. As soon as he stepped outside, Paolo noticed an odd light above him. It appeared the night wasn’t quite over for him. She left for Estrella’s painting studio, wanting more than one answer. But when she saw Estrella in her underwear, and Paolo being returned from a UFO, she got more answers then she’d ever planned to ask for. Paolo landed on the ground next to her as she finished her sentence. “I don’t feel so good,” he rubbed his head. “What… Estrella? Candy!” He stood up dizzily, feeling too guilty and confused to form a coherent sentence. “What have you done to us?” Candy turned to the painter helplessly, tears rolling down her cheeks. Sorry, aunt Yenn, she whispered to herself as she ran off into the woods after writing their memories of her… again. The sun rose fully as Candy and Paolo slowly came to their senses again. They fell into each other’s arms. “Like I could ever forget that,” Paolo beamed back at her. “Do you think anything’s going to feel any different after the ceremony?” she asked. “I can’t imagine that things could change too much for us,” Paolo shook his head happily. He couldn’t be more wrong though. Neither of them could imagine the biggest change that was about to enter their lives.